Wait a minute! Who DOES that? Oreo cookie-eating protocols have been pretty straight forward for a ton of years. And they are not meant to be flexible. You may be a “gnawer”…one who twists the cookie apart (but with less precision than a twister) and then scrapes the icing off of the one wafer with your font teeth. In all of the above scenarios, one consumes the entire cookie.. icing + 2 wafers. At no time does anyone leave behind any piece of the cookie with slobber on it! This includes the pieces that fall off into the dunked milk because you didn’t get the cookie out of there before it sloughed apart. You EAT THEM TOO despite how soggy. 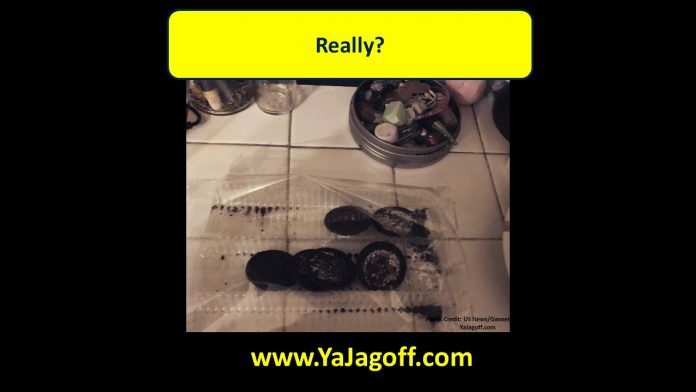 So who in their right-mind leaves the waver behind to rot in the oreo cookie casket? But that’s my take on it! Whaddabout you? Is this cookie Jagoffery? Is this a Jagoff or NOT? Thanks to BillyHo31 for being the Honorary Jagoff Cathcer!